I gave Iz one condition, though. Get a baby car seat first. We ended going anyway, baby car seat or no baby car seat. Iz said Sofia is only 2 months, she couldn't even sit. So how can she sit in a car seat? This newbie mother agreed. Betul jugak kan. Hahaha. But then my mum said we could simply adjust the seat so that the baby will not sit too upright. Oh. 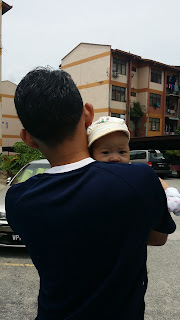 No baby car seat, I simply held her against my chest while sitting at the back seat the whole way to KL. At first her head stuck up; eager and excited to watch the view. Minutes later she was fast asleep. She slept all the way and only woke up when we arrived. Since we also packed 3 scoops of formula milk, we feel a bit secure. Haha. Like, bolehla pergi jauh sikit... Felt a strong urge to drop by Mid Valley Megamall, but we decided to just go home. Let's just take one place at a time. adam dari awal mmg ddk dalam carseat. sya gune carrier carseat tu. Oh... Thanks, sya! Dah Google tadi. Memang senang. Betul, kadang dia tido bila kita bangun dia pun bangun sekali. masa Maira 3 bulan I bawak dia pergi mandi sungai. macam nak berpindah randah kena bawak flask air lah, pampers lah and macam macam lagi. Heheh.. Jangankan mandi sungai, bawa kejap pergi jalan 30 minit pun bash bawa segala benda. Haah, pangkuuuu... Memang lenguh tangan... huhu.